Finding Old Man Wilson - Welcome to Celia in Africa! On a trip to the Kruger National Park, setting up a safari event for an international group recently, we discovered this elderly gentle soul – Wilson the Shoemaker. 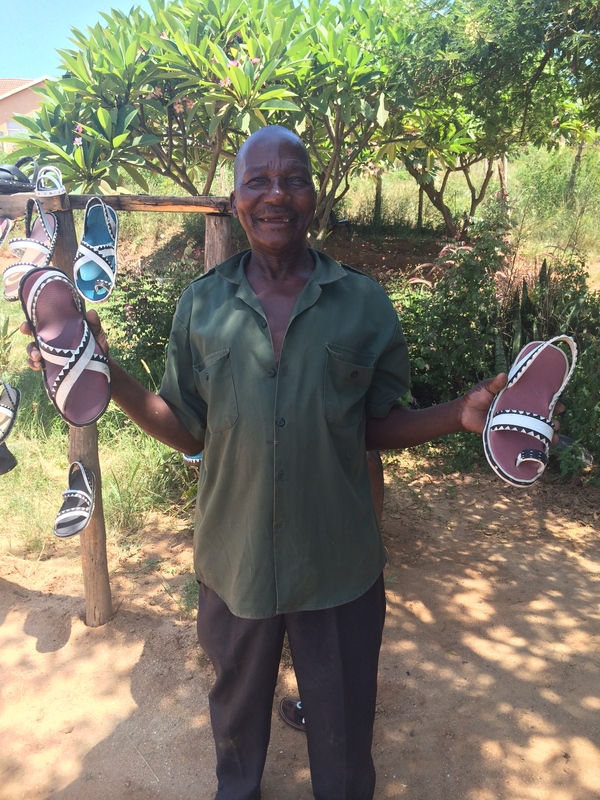 With 40°C in the shade on a sweltering summers day, he has the best location in town for his Shoe Maker’s workshop – under a magnificent old acacia tree. A few tree stump seats, a wheelbarrow with his essential tools and equipment are the bare necessities. Old Man Wilson is in his seventy’s but fit as a fiddle. He recycles old tires and turns them into funky footwear. There is a sense of wander and excitement finding gems like these. You feel a responsibility to support such productivity. His big smile beamed as he looked at me, measured my feet with his eyes, and promptly picked a pair of shoes from his handmade display shelve. I fit them on and the one’s strap is slightly loose. He runs to his wheelbarrow toolbox, enthusiastically sits at my feet on the red dust surface, pull the nails out, cut the rubber strap and refit it. He looked at me in anticipation until he got the thumbs up that it fits! Hands in the air, we both rejoice with laughter. This is the perfect pair of sandals for bush walking on a blistering day. You’ll fit in with the locals too and have something to talk about. Artisans like Old Man Wilson you don’t normally come across in touristy areas but rather in the tranquility of South Africa’s hinterland – so talented, inspiring and creative.